Successfully Added Mini Bluetooth Keyboard for Smartphones to your Shopping Cart. 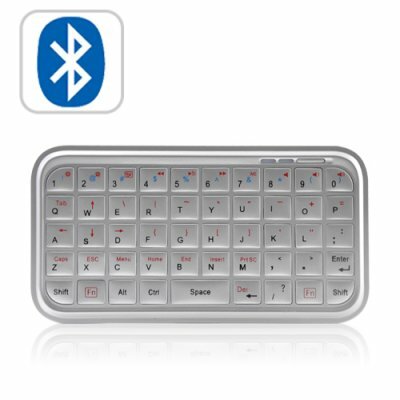 With its Bluetooth 2.0 compatibility, this Mini Bluetooth Keyboard works with most smartphone operating systems, including Nokia Symbian (S60+), Android, and Windows Mobile (6.0+). Setup is quick and easy and in mere seconds your smartphone will be equipped with the ideal tool for texting, writing emails, chatting, web browsing, and even gaming. For those who need more options, this Mini Bluetooth Keyboard even works with an iPad, PS3, and Bluetooth-enabled laptop/personal computer! The upgraded software seems to work fine without rooting your phone (programs, local shell, and ConnectBot). The hardest part is to select the IME (hold down the ?123 key and go from there, not mentioned on the TekSoftCo site). on 2010-07-13 19:43:52 Ottima Mini Tastiera!!! Ottima Tastiera funzionante con qualsiasi dispositivo bluetooth come Cellulari Nokia, PC, PS3 ecc. This paired effortlessly with my I pad and make the device much more useful as I no longer loose half the screen to a keyboard. on 2010-06-07 14:13:17 Just WOW!! Thank you, Chinavasion, for sending me this awesome keyboard! Everything works as expected and even more! Got it about 10 minutes ago! !